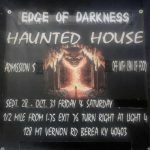 Edge of Darkness Haunted House is a Haunted Attraction located in Berea, KY. 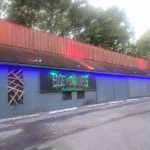 Team Zombillies reviewed this Haunted Attraction on September 29, 2018. 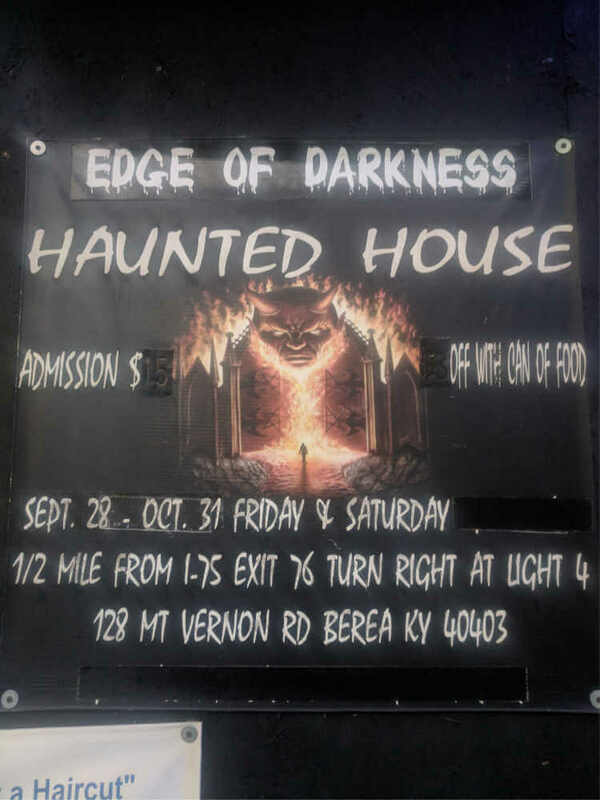 Edge of Darkness (EoD) is a small, home-grown haunted house that’s nestled in the rolling hills of Berea, Kentucky. 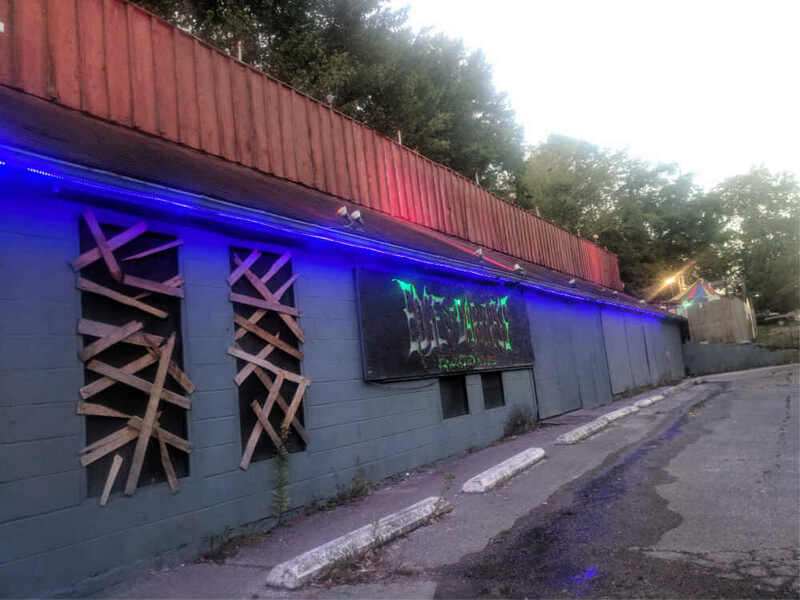 What this haunt lacks in stature, it makes up for in originality and tried-and-true scares. 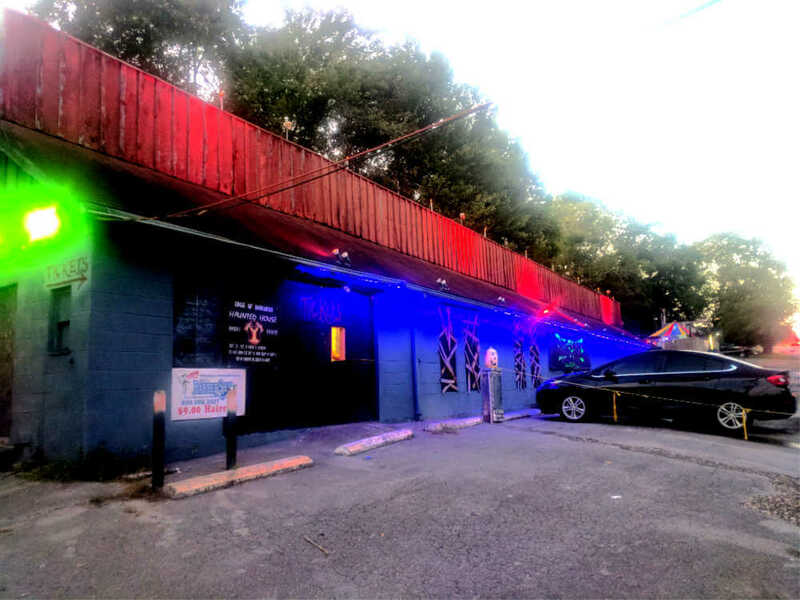 In addition to their haunt, they also have… not one… not two… but THREE escape rooms for you to test your heat-of-the-moment, puzzle-solving instincts. 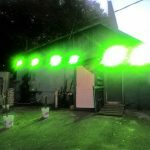 Each of them are horror themed and built by the same creative minds that bring the haunted house to life just weeks before opening day. Ready to take it to the Edge? EoD’s cast was a fairly younger, less-experienced bunch, generally speaking. However, even though we could tell they didn’t have very many kills under their belts, that didn’t stop them from having a little “fun” with us. Most of the characters in the outside maze area were clown-related, so we had several that asked “wanna play?”… to which we cordially obliged! We followed them through the writhing, pallet-lined passages, hoping that one of them would lead us to safety like they’d promised. Needless to say, our unwavering trust reinforced our now-concrete belief: never trust clowns. We will say that the maze area could have benefitted from a few more of those carnival-colored creatures, and perhaps a lesson or two on firing back when a snarky customer comes through. Nevertheless, they still helped to keep things interesting. In the indoor portion (the 2nd half) of the haunt, things got a little more intense. A couple of the monsters didn’t say anything at all, but the rest were either growling at us, yelling that we weren’t supposed to be in their rooms, begging us for help, or coming after us with power tools and chainsaws! Kudos to the guy at the end that chased us out of his morbid sanctuary; you may have won this time, but we’ll be back, mister! The costuming ranged from what looked to be store-bought attire and masks to pieces that were realistic and intimidating all on their own! There was a good mixture of masks and makeup throughout both sections of the attraction. All of the costumes that we saw outside were related to a circus in some way, but they weren’t all what we would call “complete” or “over-the-top.” The makeup that we noticed looked appropriate and on-par for a haunt of this caliber. Several of the masks were high quality and scary-looking, while others were more basic and not as effective to us. The clown wearing an all-white jumpsuit stood out to us the most. The costumes inside appeared to be more worn-in and authentic for the most part. Makeup involved blood, grunge and some darkened facial features for extra scariness. The masks added another dimension to some of their characters, including the pig mask and the one that appeared to be human skin that had been sewn together. The costumes that looked the most complete were the antlered beast (a wendigo? ), and the masked miscreant in all black near the exit. 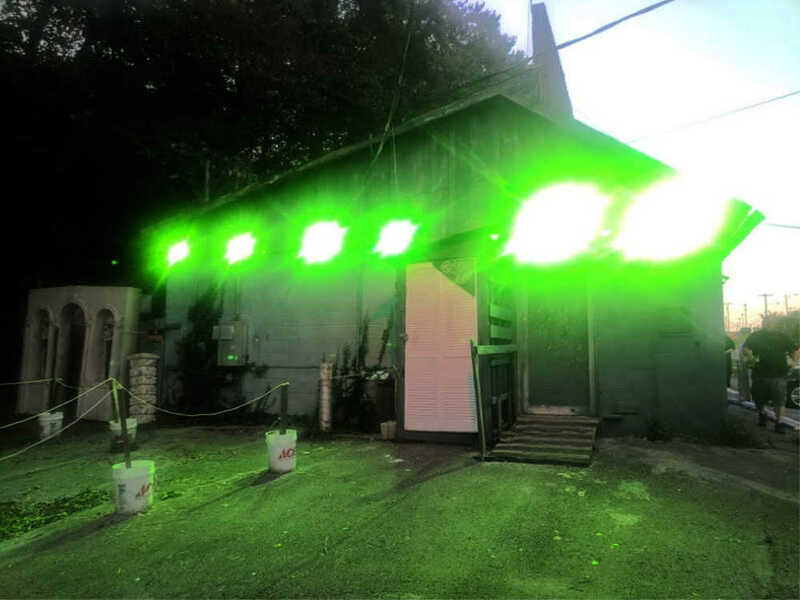 At night, EoD was pretty easy to spot due to the lights that were illuminating the front of the building, as well as their large, custom, green-backlit sign. Our handy GPS took us right to their location with no problem at all. Free (but limited) parking can be found next to the building, but it’s not far off the road, so do be careful in this area… especially if you have younger ones with you. Navigating the property was rather easy as well; everything but the actual haunt entrance was marked or otherwise easy to find. 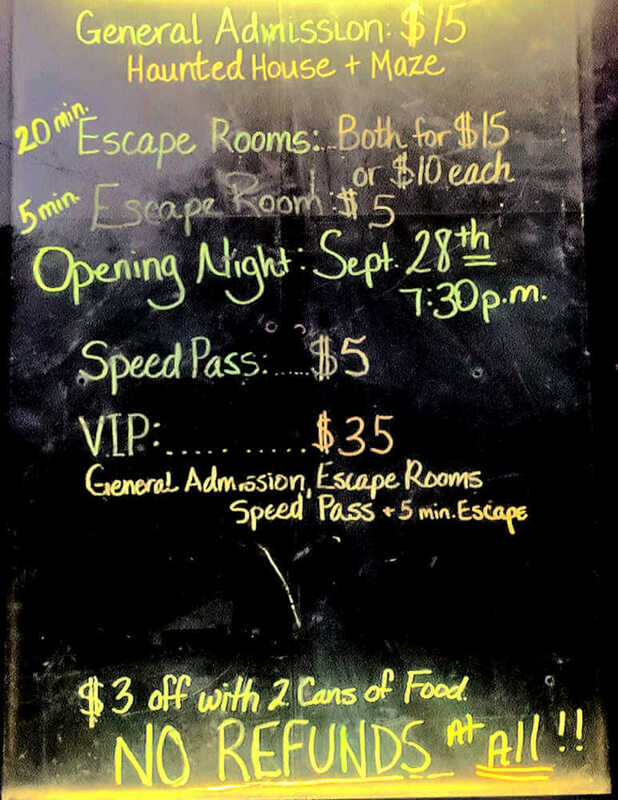 The queue line was roped off and they left just enough space between the escape room building and the queue line for escapees to have plenty of room… you know, for when they come running out of the exit! There was also a vehicle and caution tape roping off the opposite side of the queue area for this same reason, although it didn’t add much to the creepy vibe. 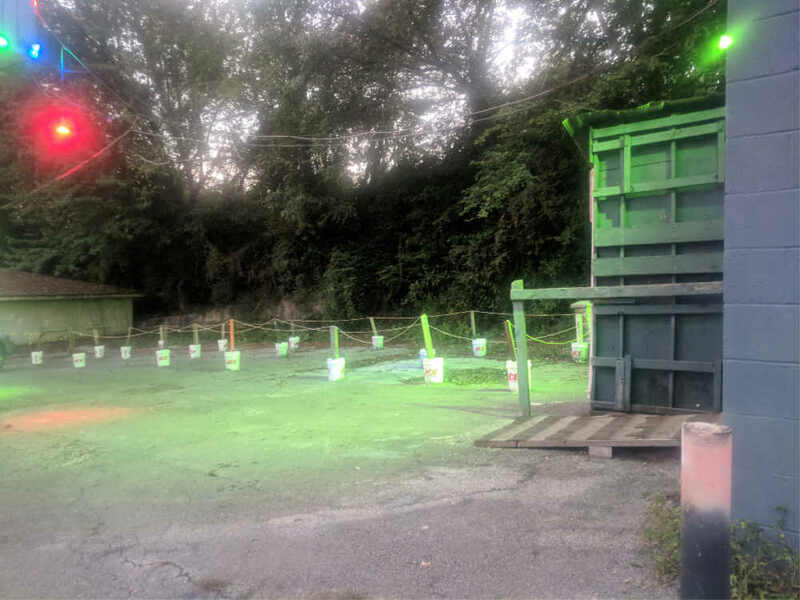 When the haunt is open, the ticket booth is easily spotted by its “open” sign and another with all of EoD’s pricing information. 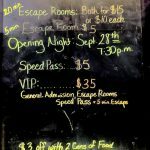 The staff members that we encountered at the head of the escape rooms, in the ticket window and at the start of the haunt were friendly and helpful as could be. Getting around the inside was a bit tricky in a few spots. We walked along the outside length of the building to get to the start of the maze. This area was wooded (with roots), the ground was uneven, and it was extremely dark. Be sure to watch your step; the path was narrow from being close to a hill and we weren’t able to see where we were going at all, save for the distant lights coming from the maze area. There was also a section of the maze that was a little muddy and slick. EoD takes place in what appears to be an older, brick gas station. We showed up when it was still daylight and upon being able to compare the building in light compared to what it looked like at night, the lights on this building sure added a malignant touch. Upon looking closer, we noticed there were candlesticks and heads on stakes lining the roof of the building. Hard rock music was playing in the queue area where green lights illuminated that side of the building. Fog was seen floating across the building as it was escaping the entrance of the attraction. An arched facade complete with skulls guarded the entrance. There wasn’t much going on in the way of preparing us to enter. However, if you happen to spot the creature behind the saw before going in, it might make you question your decisions! The folks at EoD have designed and built the majority of what you’ll encounter, all the way down to the dead bodies! With that being said, you’re likely to lay eyes on some rather wild atrocities that you haven’t seen before. You will encounter some gore here, so be prepared for that. The effects are old-school and mostly rely on the actors for effectiveness. The maze itself must be put up and taken down within a short time of when the haunt is actually open for business. It must also be able to stand up to the outdoor elements, so it wasn’t decorated anywhere close to what we experienced inside. 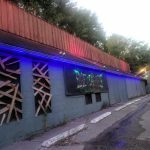 It is essentially a pallet maze with thin sheeting that has been quickly fastened to the wood and adorned with fluorescent paint here and there. The circus sound effects in this area were appropriate enough, given this color scheme, but a bit harder to hear in some spots. The maze eventually transitioned into reflective material and, when combined with strobes and swirling multi-colored lights, this made for quite a disorienting trek! At one point, there were some large blocks of foam hanging down and blocking the bath. 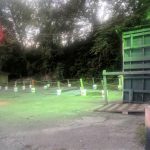 Navigating these repeating cubed objects of doom definitely slowed down our pace, and would surely prove their mettle as worthy adversaries to anyone who might be running from a certain chainsaw-wielding assailant. The transition from outside to inside involves… a slide! Our shorter group member slid right down without a problem, but the taller one managed to get themselves stuck in an “S” position for a second, which proved to be the most comical part of the evening. Once inside, the overall scenery changed dramatically. First of all, holy scents! They went through and freshly scented the rooms not long before we entered. Needless to say, our noses were just as petrified as we were! The majority of the scenes inside were actually pretty well detailed. There were so many small, creative additions that we just wanted to stay in some of the rooms to admire everything. Moving floors, walls that literally came to life, lots of dolls (including a puppet-like one on display that was made from a human), and additional earthy sounds were some of the features that helped bring these scenes to life. We didn’t notice an enveloping theme at EoD. The maze was circus- and clown-themed; they even asked us for our tickets when we were halfway through! 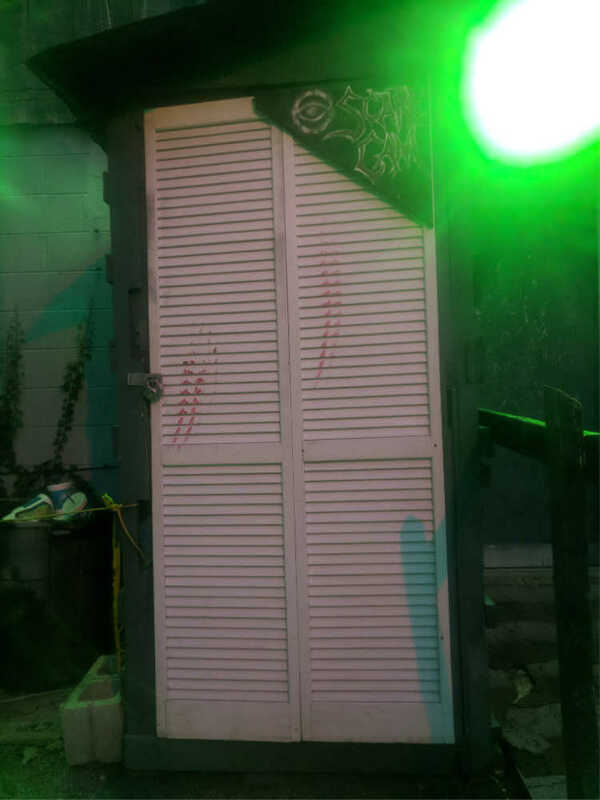 The haunted house had multiple things going on too, but we did travel through a dungeon-like area to eventually pass through a swamp, and then different areas of a house revealing a victim’s vilest nightmare; there were body part everywhere! EoD was short, but sweet, and there was a fair amount of stuff packed into this place. The variety of scares that they used proved to be enough to get several good startles out of our group! They had multiple, unforeseen surprises that (or should we say “whom”) planned their sneak attacks perfectly! Between the maze and the house, the house was the far more sinister of the two. Each member of our group was preyed upon multiple times. Sometimes they would hit the front, sometimes we would have a fiend following for a bit, and at other times, they would wait until all of us could get the full effect at once. 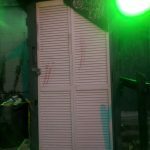 During our trek outside, we encountered a very dark area, a horn, some tight corridors, and some of the clowns were sneaky enough to spook us as we rounded their conniving corners. One of the clowns did a superb job of hiding for quite some time in complete silence, only to reveal his presence when the timing was optimal! There are other things waiting for you in the maze, but as you know, we can’t give them all away, now can we? Things changed quickly on the inside as we realized those within didn’t take kindly to humans, as made apparent by the filleted torso that was strung up in the middle of the first room. We ran into more helpless victims that we felt sorry for later on; their aggressors didn’t take no slack! A few prime hiding spots caught us off-guard and they’ve got a surprise waiting for you in their closet. When we found it, one of our team members tested her screamer (yep, it still works)! 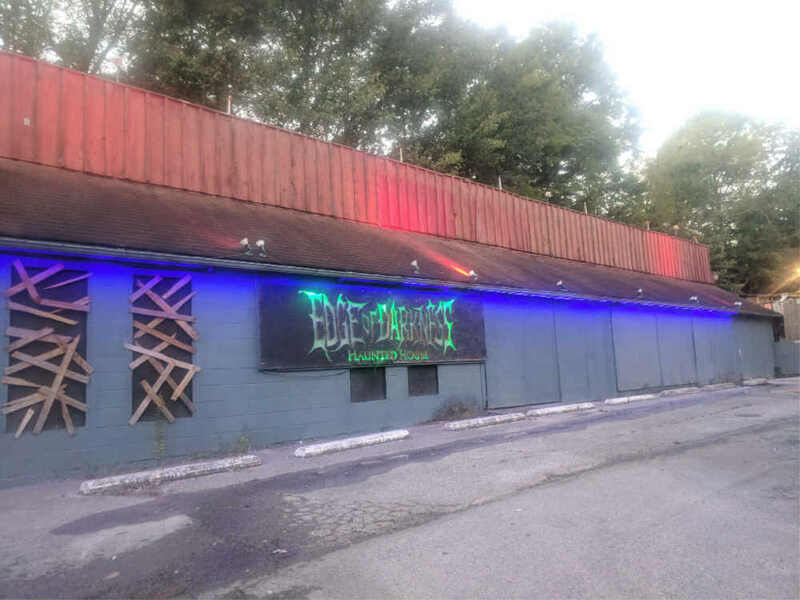 General admission to try your luck at finding your way out of their maze and experiencing the horrors within the haunted house will cost you $15.00 per person. If the lines are long and you’d like faster entry, speedpasses can be purchased for an additional $5. It took us a total of 19 minutes to escape both sections (about 4 minutes longer than last year), bringing their MPD (minutes of entertainment per dollar spent) to 1.23, which is a bit shy of the average that we see most often. Though, it should be noted that each group’s tour time may vary due to how quickly you can exit the maze. 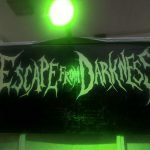 As mentioned above, Edge of Darkness also offers three different escape rooms this year. Two of them are 20-minute rooms priced at $10 each or $15 for both. We took the challenge and attempted one of the large rooms and it was actually a lot of fun! Be prepared to get dirty and slimy, depending on which room you choose. They have some interesting tech in them too that will have your mind blown… if you get that far along! 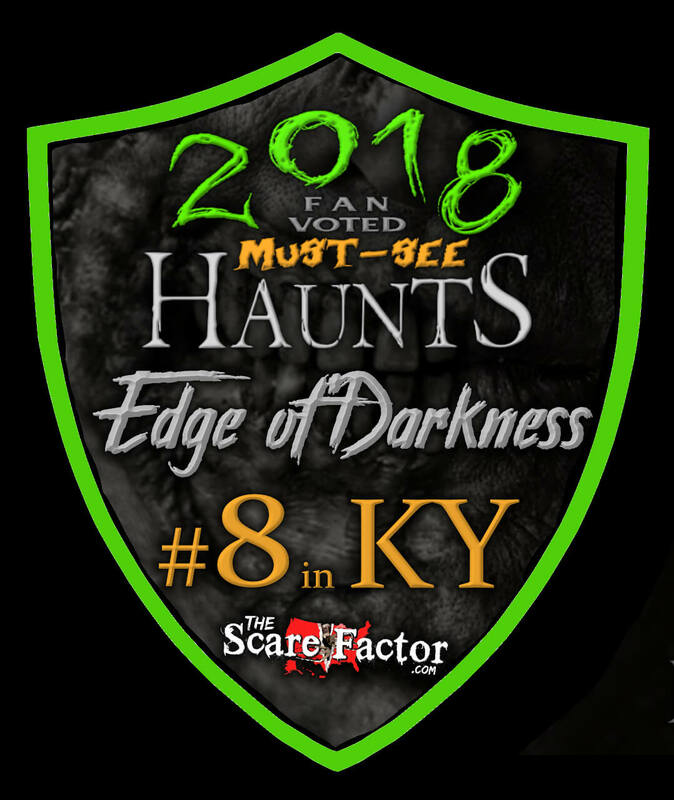 We also looked inside the other, large room and, if you think you would like these (there are no actors to scare you, but they *are* horror-related), then we highly recommend trying them both. They also have a 5-minute room that we racked our brains in, which is $5 by itself. For those who would like to go all in and take the ultimate challenge, VIP tickets are available that include admission to all of their attractions for $35. You can also receive $3 off admission by bringing 2 cans of non-perishable food. When it comes to queue entertainment, we have to say that it wasn’t really busy while we were there (right at opening time on their 2nd day of the season), but the clowns did come out to interact every so often, as well as the creature that was tasked with making folks run screaming out of the exit. There was also hard (but not super-loud), Halloween-related rock music playing outside. 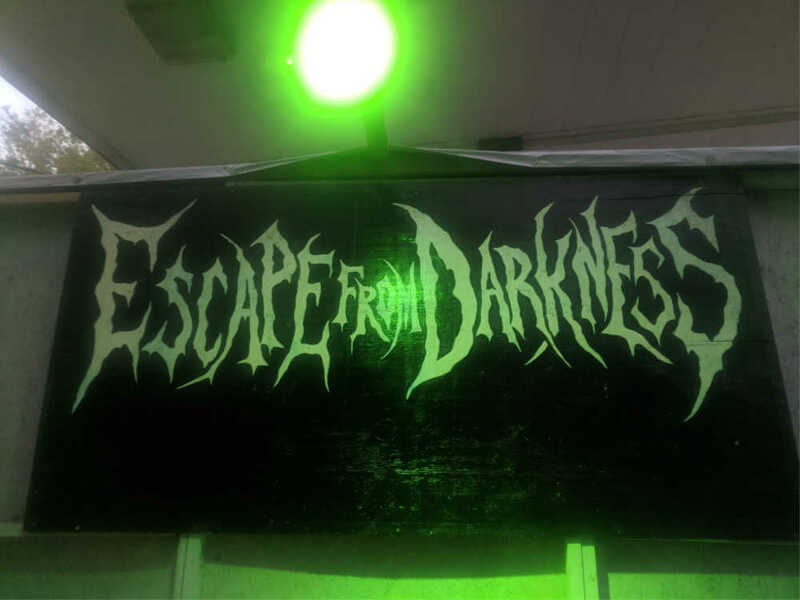 If you’d like to watch some unsuspecting victims get some jumps, then try your hand at EoD’s Scare Cam; trigger certain things inside the attraction and give them some of the scares yourself! It’s an additional $5 to scare people with this for 15 minutes, which is especially valuable on busier nights. 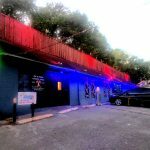 For those who think they may be too frightened to go through, they do have the option of giving you a glow stick so they won’t go after you as badly. 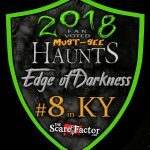 This was our second season attending Edge of Darkness and the creativity and overall energy from the staff is enough to make us want to return each season. Plus, they even got a few jumps out of us! If you decide to pay them a visit, we hope you’re good at mazes! Wonderful place friendly owners! And they’re doing it for a great cause ! Great time, wonderful people, wonderful time!